Sony found time to sneak in a Christmas Day PS Store update, and there’s actually a couple of sales and pieces of content worth checking out. 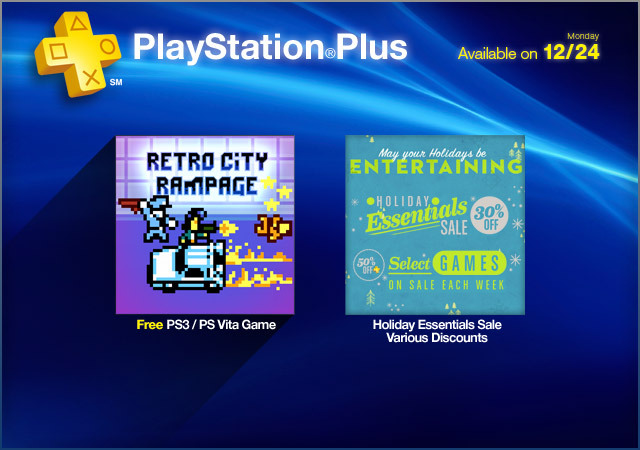 If you;re a PS Plus subscriber make sure to grab Retro City Rampage for free for the PS3 or PS Vita. Take your MotorStorm RC experience to the extreme with this “Complete” Edition, including the full game and all its DLC! Elite Vehicle Value Pack ($0.99) – Become one of the premier stars of the MotorStorm RC Festival with this money saving Value Pack – featuring all eight super-cool vehicles in the Elite collection. Mischief Vehicle Value Pack ($0.99) – Spread madness and mayhem through the MotorStorm RC Festival circuit with this Vehicle Value Pack, containing all eight of the vehicles from the Mischief collection. Veteran Vehicle Value Pack ($1.99) – Get back behind the wheel of some all-time classic MotorStorm vehicles and relive past glories with eight rescaled racers in this Veteran Vehicle Value Pack. Special Vehicle Value Pack ($2.79) – Make your mark on the MotorStorm RC Festival with 20 of the most outrageous and unique vehicles ever to take to the track. Double Expansion Value Pack ($3.99) – Take your MotorStorm RC experience to the next level with the Pro-Am and Carnival Expansion Packs, containing a total of 10 tracks, 40 events and 16 additional vehicles to turbo boost your RC Festival experience. Canada Track ($4.99) – Download the F1 RACE STARS Canada Track! Dodge the grumpy groundhogs and race across a frozen river in this brand new F1 RACE STARS circuit! China Track ($4.99) – Download the F1 RACE STARS China Track! Whip through water gardens and speed along a dragon’s back in this brand new circuit! India Track ($4.99) – Download the F1 RACE STARS India Track! Make your move through a mountain railway pass, overtake in the overgrown ruins and power through palace gardens in this great new circuit!